I started my blog about five months ago, so I am pretty new to blogging. I am so grateful for the people that take the time to read each and every one of my posts. I am also so thankful to be nominated for this award from Daisy Michelle, who is such a talented blogger. Please take the time to look at her posts here. 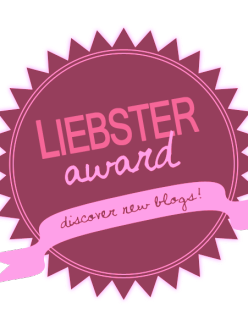 The Liebster Award is given to bloggers by other bloggers and I find it truly inspiring that we can all support each other. 1. How did you come up with your name? I came up with my blog name because I wanted something that would explain my life and what better name than “The Life of a Fashion Student”? I chose this name because fashion is not only my major in school but it’s everywhere around me and in everything I do. I started my blog because I wanted to share my love for fashion with everyone else. As many of my readers know, I blog about so much more than just fashion and it’s really because I enjoy sharing every aspect of my life with my readers. 3. What do you love most about blogging? I think my favorite thing about blogging is when someone comes up to me at school and tells me how much they loved my blog post. It means so much to me because I blog not for the amount of followers or views, but because I’m passionate about what I write. 4. What do you value the most in life? It’s more like who do I value the most in life because my family and friends are seriously my life. 5. One goal you wish to accomplish this year? This year my major goal is to graduate college. I have been working hard to graduate early and I can just picture the diploma in the palm of my hands! 6. What is your favorite social media site? PINTEREST! Pinterest is seriously perfect because you can go on it to look for new recipes, fashion ideas, home decor trends, a good laugh, and so much more. 7. If you could travel to only one place this year where would it be and why? If I could travel to only one place this year I think it would have to be Italy, so I could go visit and meet all of my family out there. 8. How would you describe your personal style? My personal style can be best described as girly. I love playing with bright colors and patterns (especially cheetah). I also like to dress differently depending on my mood. For example, if it’s just a boring day and I’m going to a coffee shop to study, I’ll wear a flannel and beanie and dress it up with cute accessories. 9. Spring or Fall Fashion? That one is so tough because living in Chicago there’s not really set seasons 😉 but I love both seasons because spring is filled with colorful and pastel pieces, and fall fashion is very comfy and cute with a pair of boots, which I love as well. 10. If you could choose one store to shop at, your entire life, which store would it be? Nordstrom Rack because I can find everything there at such great prices and they have such an awesome online selection! 11. Are you a planner? or are you spontaneous? I think anyone who knows me knows that I am a big planner. I like having a set schedule and sticking to it. Everyday I make a to-do list so things will actually get accomplished. I’m trying to become more spontaneous though! You ladies can use the same 11 questions, or come up with different ones to share with us!